London is a wonderfully vibrant, varied and exciting city. 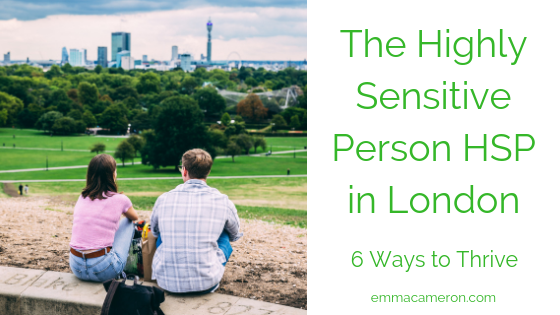 And if you happen to possess the trait of high sensitivity (HSP) London can also be really quite a challenging place to live or work. 1. Keep things simple – but not too simple! Sticking to familiar routes and places to visit can help you feel calmer, and reduce the sensory impact of new sights and sounds. But make sure you shake things up a little from time to time, when you can. So along with having enough predictability and regularity in your week, also aim to visit a new place every week or two. Avoiding doing new things may feel like a solution, but in the long run it can have the unwanted effect of shrinking your world and limiting you, leading to increased anxiety and depression. Although it’s important to mix with a range of personality types, it can also feel very validating to have a few friends and/or acquaintances who know from experience what it’s like to live with the trait of high sensitivity. Use your capacity for attunement and deep connection with others to help you sense which work colleague (or which person at your yoga class) might be a fellow HSP, and a potential friend. Look online for a London Meetup group for HSP’s that you can connect with. Anxious about going? That’s normal. Tell yourself it’s okay to feel the anxiety and go along anyway (most things that are worth doing come with a dose of discomfort, especially at first). It’s important for HSP’s to take basic self-care seriously. This means a bit of self-parenting: making sure you get to bed at a decent time so you catch 8 hours of sleep, eating regular and nutritious foods, and making opportunities for exercise each day. Play and fun are also vital for helping HSP’s replenish their sense of meaning and satisfaction in life. Do make sure, though, that you tune into what’s genuinely enjoyable for you, rather than always trying to go along with someone else’s idea of pleasure. If you find that you’re struggling to feel enjoyment in things, you could be suffering from anxiety or depression. Some sessions of online counselling could help you sort out what’s going on, freeing you up to reconnect with your capacity for joy and playfulness. Some HSP’s in London enjoy sessions of open-air swimming on Hampstead Heath, walks in London parks, meditation and gentle yoga groups, and nature-based practices like Shinrin-Yoku (‘forest bathing’). The trouble with working in London, especially if you work long hours and also have a lengthy commute to wrangle, can be fitting proper self-care in to the time you have available. And on top of this you need to make time for other things that will enrich your life, such as socialising and cultural activities. So you have to get inventive about what could be combined or done differently. For example, could you go to your Pilates class with a friend, or go running together, so social contact can be combined with keeping healthy? If you’re looking for a therapist, could you work with an online counsellor from the comfort of your own home or office, and save time that would have been spent travelling to and from therapy sessions? 5. To escape the city – or not? Anxiety, overwhelm, worry, and depression are not unusual in highly sensitive people who are navigating the London lifestyle. If these feelings hit you hard (or often) you might start to think that the only solution is to leave the city and retreat to somewhere quieter. For some highly sensitive people, heading to a smaller town or village may indeed become the right move. But escaping from the city isn’t an option for everyone. And besides, it might not align with other things in life that you value (such as your job, your partner, or being in a cultural hub). So then the question becomes more about finding adaptive ways to manage your sensitivity whilst also enjoying the many pleasures and delights of London life. Talking through big decisions (like changes in location or job) may be easier to do with someone who doesn’t have a vested interest. A few sessions with an online counsellor might help you get clarity on how to balance your different needs and priorities. Being ambitious, and pushing ahead at work, can sometimes be tricky if you have a highly sensitive nature. You may get frustrated that your hopes, plans and dreams for yourself tend to wither because it’s hard to follow through when you sense difficulty. Maybe you have a weird, vague inner feeling that growth and expansion are somehow ‘not allowed’. Or you may simply lack confidence and feel like a bit of an impostor, even when your rational brain knows you are qualified and able. If you’re lucky enough to have a truly supportive partner, or a small circle of friends who believe in you and can cheer you on when things feel hard, this can make a huge difference. It can also be helpful to work for a while with a therapist who can tune into you as an HSP and understand where you are coming from, and what you’re trying to move toward. Online therapy can be a great option for commuters and London-based folks, partly because it saves so much time. Many sensitive people find it’s a very effective way of getting support and helping them find new ways to live in a way that suits them. I offer online counselling via video (like Skype) with highly sensitive people HSP in London. You can read about some of the reasons that thoughtful, sensitive people opt for online therapy here: Highly Sensitive Person’s Guide to Online Counselling.